Camouflaged amongst the leaves, a battle waged. The silent war waged on. Two combatants, four gossamer wings−a fight the death. The female Praying Mantis lost her grip on her mate and tumbled off the leaf, landing on the blanket where a toddler lay sleeping beneath wires hung heavy with vines. Not far away, the mother and her friends pulled hops from high overhead and dropped them into long cloth bags carried on their shoulders. As the morning progressed, more of the stripped vines lay trampled beneath the barren twelve foot high wires. Mary halted her work and checked her watch. She dropped her bag and ran to the blanket where her toddler lay sleeping in the shade. Unaware of the recent battle that had just occurred overhead, Mary flicked the Praying Mantis from the blanket, changed the baby’s wet diaper, neatly folded in three, and redressed her. Her husband’s enlistment after the attack on Pearl Harbor forced her to the fields to supplement his military dependent check. She only agreed to pick hops because she could bring the toddler to the field while the other two children attended school. Her older daughter could watch the baby after school. Mary covered the child with a light blanket and checked the direction of the sun. In an hour, she would move the baby to another shady place closer to where the women worked. Mary placed a toy horse next to the sleeping baby, kissed her forehead and hurried back through the tangled vines to her half-filled cloth bag. Her companions had moved somewhat ahead on the next row, leaving her alone in the center of the field. She pulled off her headscarf and wiped her brow, retied it quickly and refastened the heavy bag to her shoulder. She would need to work into her lunch hour to catch up with her friends who didn’t have to stop so often to check the baby. As she neared the area where her friends worked, peals of laughter accompanied exaggerated tales bearing only the faintest resemblance to their romantic encounters. Her bag nearly full, she dragged it to the weighing station where the foreman recorded its weight. On Friday, the tallied numbers beside her name represented a few cents per pound in exchange for the week’s back-breaking work. If she worked hard, she could earn $25 a week. “I’ll work into my lunch hour, Wilson. I promise. If I have to, I’ll work late. Whatever it takes, okay?" “You know we’re on a time table. We’ve only got three more weeks of picking time before the hops start to rot. If you can’t keep up with the others, I’ll have to get someone who can. Since Lilly’s gone, I’m short-handed, so I’ll let it go today. Work faster, will ya'?” He tossed the cigarette and ground it into the tangle of vines with the ball of his foot. Mary pulled hops from the vines overhead as fast as she could, and stuffed them into the sack. It wasn’t fair of Wilson to compare her work to the others. They didn’t have to stop every twenty minutes to run and check on a baby, brought to a dirty field for lack of a caregiver. She hated bringing her to the field. Sometimes, when she returned to check on her, she’d find her gone. It could take five or ten minutes to find the wandering child. Once, the baby had followed the tractors from the weighing station to the loading trucks, bound for the factory to be made into beer. What could have happened, almost made her quit. But the money was too tempting. The $150 she could earn during the six-week picking season would come in handy this winter when no seasonal work was available. She wondered if she should keep her daughter home from school to baby-sit the remaining three weeks. These days, with men off to war, older children were often kept from school to watch the younger children, allowing their mother to work. The family did what was necessary to survive. When all the hops within reach were stripped, Mary pulled the vines overhead. They tumbled into the pathway. She leaned over to glean the hops from the ground, gritting her teeth against the pain, ripping through her back and shoulder, a daily occurrence for the past week or so. Lilly−a middle aged Japanese woman was the first to welcome her to the field. Lilly’s husband owned the local grocery store. Following Pearl Harbor, suspicions against Oriental citizens began. 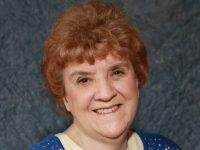 Lilly and her husband thought their ties to the community, owning their own home and having a business would protect them against such prejudice, but it hadn’t. Then the President had made an unprecedented announcement regarding Japanese-American citizens. Yesterday afternoon, several military men came to the field, asking for Lilly. The women and Wilson argued that her family had been here for generations; that she was no threat to our country, but to no avail. The men claimed her family would be held in an internment camp, to keep them safe until the war ended. “What will become of her home and her business? Will the children be able to go to school? What is an internment camp? When can she come home? Why would the United States do this to its own citizens?” The soldiers had no answers. Lilly was forced into their truck. Her U.S. citizenship could not compete with her nationality or war-time racial prejudice. So, Mary’s job in the field was secure for the time being because Lilly was gone. Mary hardened her heart to Lilly’s plight and faced her own difficulties. For the next several weeks she would work hard and save her money. When hop season ended, surely, something would turn up. It had to. Her dependent’s check and ration stamps would get them through this winter. Next spring, she would plant a Victory Garden. Her son would collect for the rubber and metal drives with the other boys. They would buy a War Bond next month. She would knit socks for the boys overseas with the Ladies’ Auxiliary and contribute to the rag and paper drive. She would serve coffee at the USO once a month. Next year, she could pick beans, berries, and apples and then, in the spring, rows of new hops would grow, twisting round the wires, reaching skyward toward the nourishing sun and rain until they blossomed and produced fruit. Then would come the harvest and the cycle would begin again. Perhaps next summer the war would end and Ed would come home. Somehow, someway, she would endure. She heard the baby wail at the other end of the field. She took the bag from her shoulder and walked back to tend the child. The baby’s blanket lay just beyond the next pole. 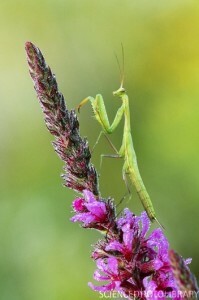 The female Praying Mantis lifted her head from the trampled vines. All was quiet except for the crunch of the approaching woman’s feet. The Mantis rose to her hind legs and defiantly waved her antennas toward the unknown danger. Her home was yanked down, thrown to the ground, trampled and ground into the earth, and ripped asunder by human hands. Powerless to stop the destruction, she sat within the ruins, small and defenseless compared to the giant approaching, yet she took a stance in defiance, ready to fight to the death to protect the unborn she carried within. She would not give in to the madness that was once her peaceful world. She would endure. She had to endure, because there was no other choice.